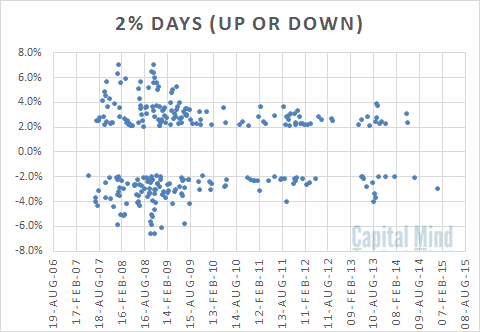 A 3% Down Day Wakes Up A Docile Market After More Than A Year! While this was a horrible day, it has to be seen in context. We have had very little volatility recently. And that’s made a lot of us quite complacent. Today was a wake-up call. It’s not all right to use recent data to back test a theory because the recent lack of volatility was abnormal. 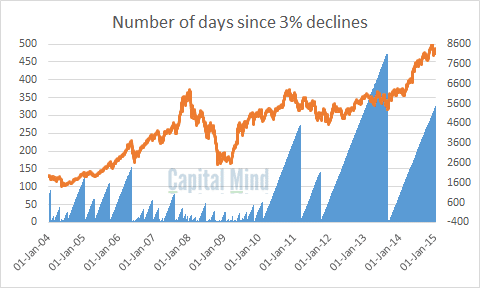 At Capital Mind we have continuously highlighted the lack of volatility. It makes no sense to believe that it will end tomorrow, but we have to have a plan for when it does end. Stay lean, stay nimble, and respect your stop losses. This is like our recent post about the Inflexion point in IT. It could be the inflexion point for volatility as well. History repeats itself, and history has a lot more volatility than we have seen recently. Expect many more big wide dots in the graph above! Disclosure: We have both long and short positions.